SailScovare.com - Sailing Adventures from 1 hr to 1 year. Private 90 minute Private Introduction to Sailing Course/adventure $299 for up to 6 people on our 25' sloop! Come aboard for a 90- minute introduction to the world of sailing! Learn to take the helm on the beautiful Willamette River on this hands on "crash" course in sailing basics- Parts of a boat, Hoisting Sail, Steering, Tacking, jibing, some basic rules of the road and we may do a couple man overboard drills- Just to mix it up! You've always wanted to try sailing and this hands on experience will help you decide if you want to explore sailing further! Or learn to sail on your own boat - Only $90 an hour. You CAN Sail into the sunset on your own yacht! This three hour seminar will help turn your dream into a reality - in 12 months or less! This seminar is for ALL skill levels - whether you are completely new to sailing, or have years of experience... and all budgets from $500 to 5 Million dollars! You will learn about vessel selection, inexpensive acquisition, preparation, castoff locations and destinations worth dreaming about. We will cover the skills you need and how to get them and also share the five secrets to a successful voyage and why a washer is so much more important than a dryer! So, if you are ready to turn your dreams into a reality, simplify while enriching your life, and experience a world beyond your imagination, then this is the seminar for you! Includes snacks, beverages and ongoing consultation to help realize your dream! $199 per person with a 2 person minimum. Call or email to reserve today! 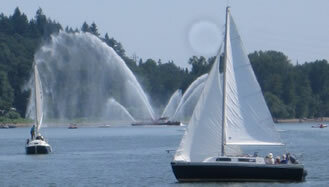 Scovare's captain is both U.S Coast Guard Licensed and an American Sailing Association Certified Sailing Instructor. He also has well over 50,000 ocean sailing miles in boats 18 to 81 feet. We can help you learn to sail anywhere in the world on your own and help you realize any other sailing dream you may have. We offer instruction while you are chartering with us, if you desire, and can teach by the hour locally as well. We also provide consultation for boat purchases or cruise planning. To find out all your sailing options, please join us for a short sail or give us a call.